Het huis van Grant Gulch is een ruime, comfortabele en handige uitje, die comfortabel is geschikt voor 6 en biedt alle voorzieningen die u in een eerste klas vakantie thuis zou verwachten. Minimaal 30 dagen huur alleen. In de buurt van Zion National Park (30 min), 0,2. 5 uur noordelijke rand van de Grand Canyon, 2. 5 uur naar Bryce National Park, 2. 5 uur naar Lake Powell. 2 uur naar grote skiën in het noorden van Utah. Grant's Gulch was so much more than advertised. We felt right at home the first time we walked through the door. 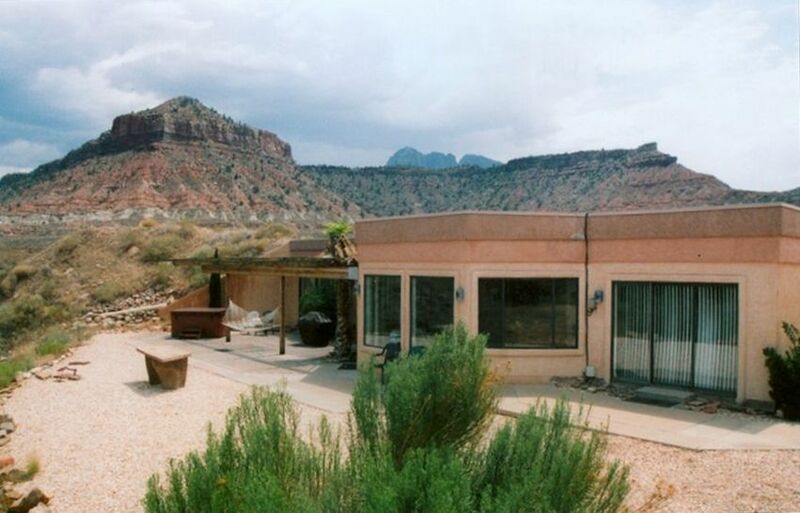 Centrally located to not only Zion Park, but also the Kolob Canyon and Kolob Terrace Road. A number of state parks around St.George aren't far away. Suggest you head to LeVerkin for groceries at Davis's, shop on Tuesday and get a nice discount on gas. Noodles and Pizza served very good pizza, the Bit N Spur was great. Be sure to get their homemade peanut butter pie, delicious! Harry and John were very responsive to the couple of questions we had. I would definitely recommend Grant's Gulch to anyone looking to vacation in the area and we hope that we will be able to return. This was, without any doubt, the best homeaway experience we've had. We had an outstanding month in Grant Gulch and are in full agreement with the previous reviews. It was a very comfortable accommodation with helpful, friendly neighbors. The views are spectacular! What more can we say? We have thoroughly enjoyed our stay at Grant Gulch House. It is quiet, convenient to the Park, well equipped, and charming. We would stay here again without reservation if we are ever in position to return. The House is easily one of the most beautiful places on Earth! And, this was far and away the best family vacation we have ever experienced. The house is gorgeous with amazing views and the friendliest hummingbirds you'll ever meet. Within a few hours "the babies," as we called them, will fly right up to you! Further, my 10 year old son was flatly amazed by every trek we took in the surrounding National Parks. My husband and I have vacationed there alone before, and we fell so in love with the place, we talk about moving there all the time! We discovered this summer that it serves equally well as a family spot. The majesty and beauty of this house and everything around it can literally bring you to tears. My husband and I thoroughly enjoyed our stay at the Grant Gulch house. It was the most peaceful, quiet and beautiful place we've ever stayed in this area. The house has all the amenities you need and is full of sunshine to start your day. It was clean and comfortable with a nice open layout just as described. The views from the deck and the hot tub are beyond compare as well and we really hated to leave. Zion Park is less than 15 minutes away and when you drive back to the house, you leave the crowds and hustle of the park behind. This house is a fantastic retreat while visiting this area and we highly recommend it. We also recommend the farmers market at the Bit n Spur each Saturday and the Hirishi produce stand on the main road to town. Can't get better than this!! My sister and I absolutely fell in love with this house and its surroundings. The house is a home you've been welcomed into warmly by Helen--comfy furniture and beds, skylights and big windows make this a bright and airy place to stay. The views are much more spectacular than the pictures convey--sunrises, sunsets, clouds, sun, the view of the mountains is always changing. The kitchen is well appointed, the two bedrooms are on either side of the house so there is lots of privacy. You can walk out the door and go for a good hike into the hills or down the road to Grafton, a ghost town. You can sit on the patio and watch the lizards and hummingbirds do their thing. Lots of hikes close by, as well as all that has to offer. We also used this as a base to go to Bryce and the North Rim of the Grand Canyon. Just can't say enough how much we loved this house--confession: I cried when we had to leave!! Also the house was clean; Helen is helpful and always available; I would recommend this to just about everyone, especially if you like peace and quiet and solitude. We loved being away from the crowds at that Parks. A great place for artists to paint or draw, for writers to write, for those with a spiritual bent to meditate. Thank you Helen for welcoming us so warmly and for making us feel right at home. We sure hope to be back! !